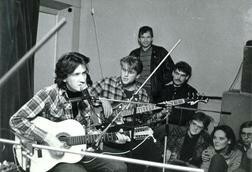 Rock-group Ado appeared in 1988 in the town of Kolomna,- the Moscow region. Several home records were made there. In 1990 the group moved to Moscow and recorded its first disc "Stop Me, Night", which was published by the then major USSR record company "Melodia". Ado has always played melodious acoustic rock with texts of the Bob Dylan and, to some extent, "The Beatles" style. The full list of Ado albums and the REAL AUDIO format records can be found on this page. The latest Ado album called "Behave Yourself" was issued on Belgian label MDC Records. To promote this album Ado was the first group in Russia to shoot an animated plasticine video (for the title song of the album). In 1997 signed a contract on publishing and re-publishing of some their albums with a Russian record company RDM. On this page Ado is represented by its albums, a detailed information about the group, a news bloc, numerous illustrations and a digest of "A Little Desire" music magazine issued by Ado in 1990-1993. Ado have 8 albums. Last aldum named URSUS (2007).